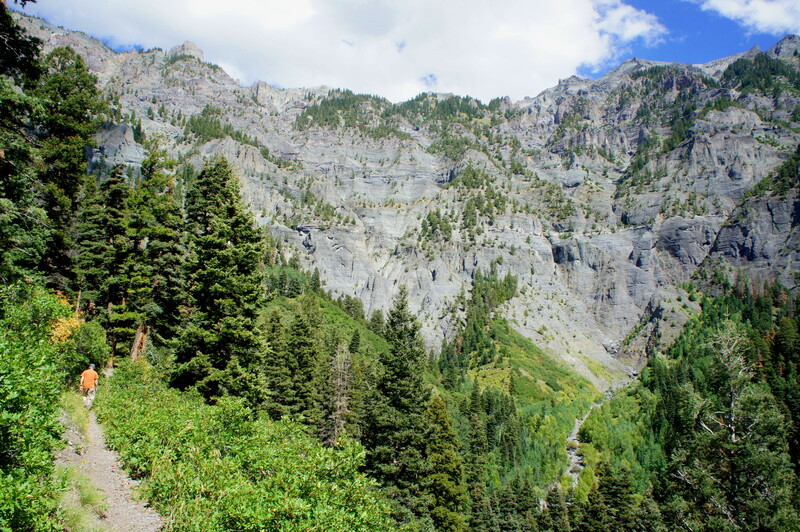 The Portland Trail, just outside Ouray in southwest Colorado, offers close-up views of one of the area’s most striking features: a highly sculpted, bowl-shaped cliff face known as the Amphitheater. While composed mainly of grayish, volcanic rock, this west-facing wall is illuminated in the evening light, bringing out the whites, yellows, and purples and allowing visitors to examine the intricacies of the glacier-carved valley. 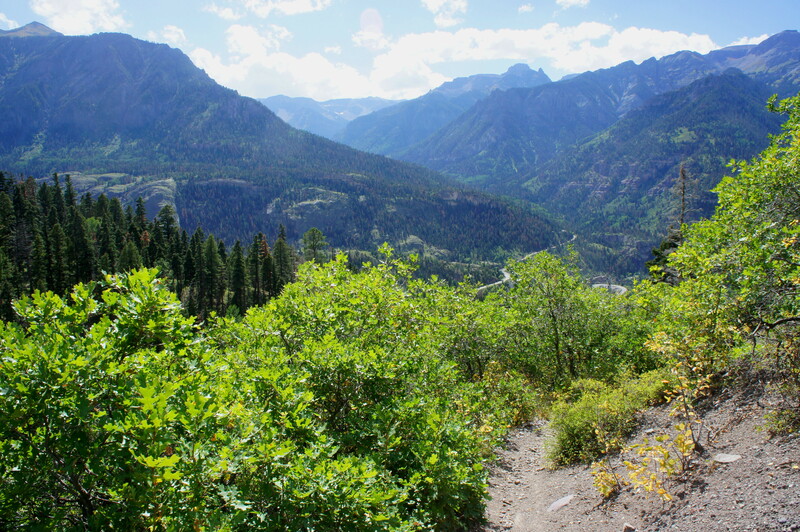 At just 3.5 miles with a very gradual ascent of 750 feet, the Portland Trail is also one of the Ouray area’s easiest hikes. Hike this loop in mid-afternoon, waiting for the morning shadows to fully lift, for the best views of the colossal Amphitheater. 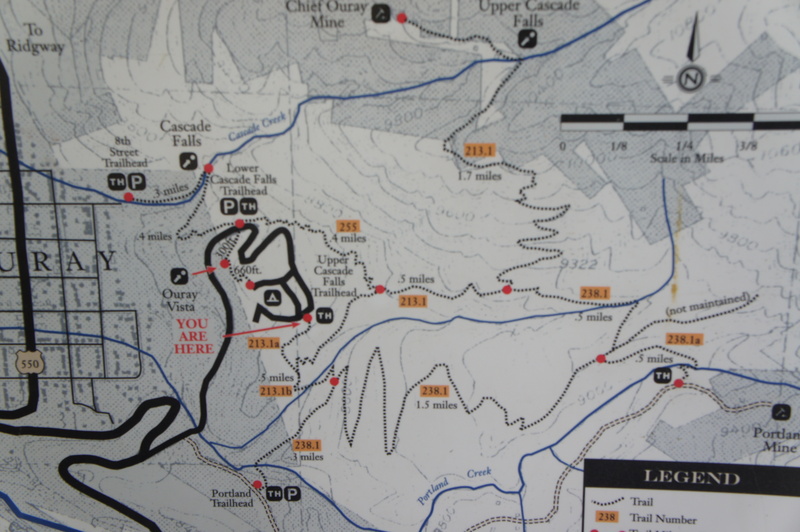 For the next 1.5 miles, the footpath will climb gradually to the hike’s high point at around 9,200 feet. The ascent is made relatively painless by the development of long, gently-sloping switchbacks, the first of which you will round at about 0.57 miles. Occasional clearings offer nice views looking back toward Ouray, Hayden Mountain (13,206’), Potosi Peak (13,786’), and the Canyon Creek Valley. As the trail ascends higher, aspen trees pop up amid the mixed conifers, and the trail traverses hillsides of scrub oak and mountain laurel. 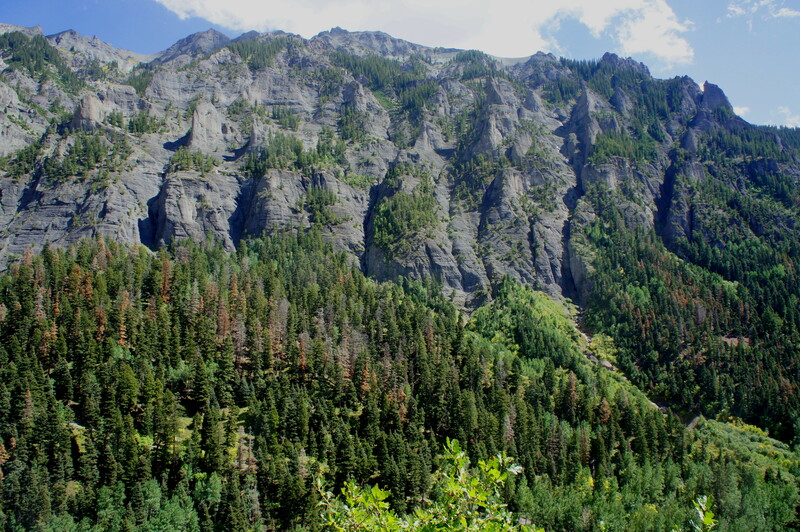 The stony mass is capped by an unnamed peak that tops out at 13,111 feet and bounded to the northeast by peak aptly named Bridge of Heaven (12,368’), which can be reached on a very difficult hike from the Horsethief Trailhead north of Ouray. Dense stands of conifers and sporadic grassy pastures fill the bottom of the cirque, adding allure to the mountain nirvana. After enjoying a snack break at the viewpoint, continue northward on the Portland Trail as it reaches the highest point on the hike at around 2.2 miles. Here the trail forks again: a ½-mile spur trail continues straight ahead, leading to the Portland Mine and Portland Mine Road, while the loop continues left. Plunging back into the trees, the Portland Trail begins a sharp descent as it approaches the Little Portland Creek drainage. At 2.4 miles, the rocky trail crosses the creekbed—likely dry in summer—then traces the northern bank as it continues downstream. 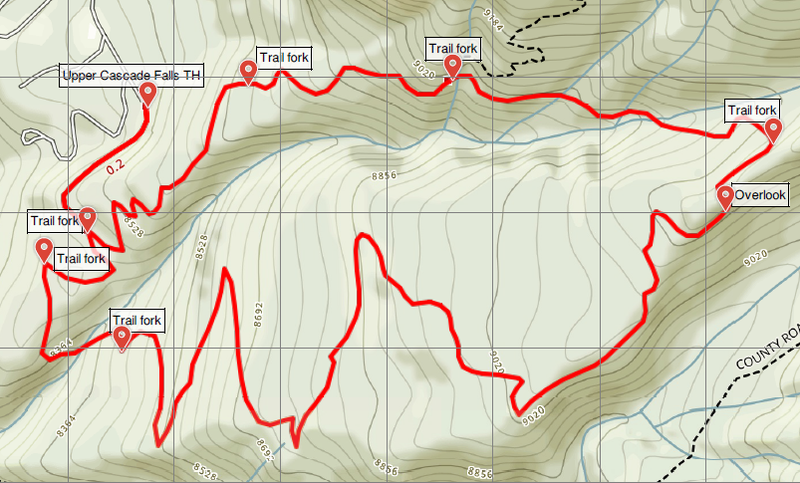 Crossing a series of tributaries, the trail bounds up and down before meeting a signed junction with the Upper Cascade Falls Trail at 2.7 miles. 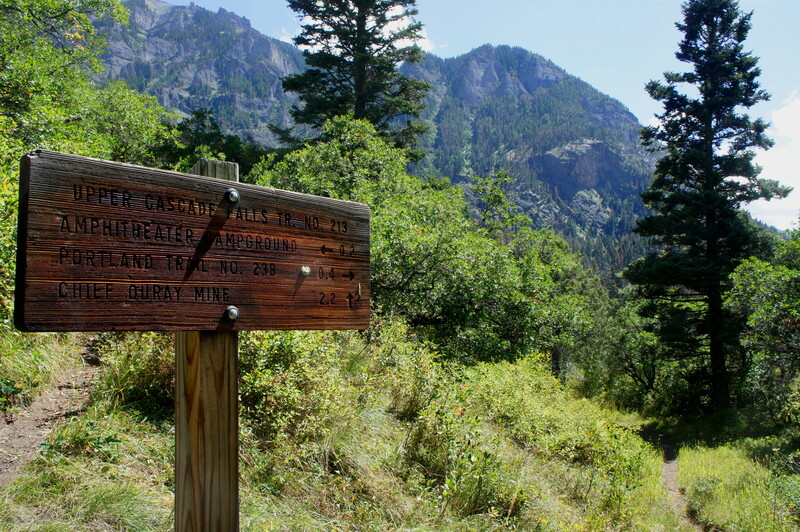 Stay left on the main track, also the main thoroughfare for hearty hikers heading to and from Upper Cascade Falls and the Chief Ouray Mine. 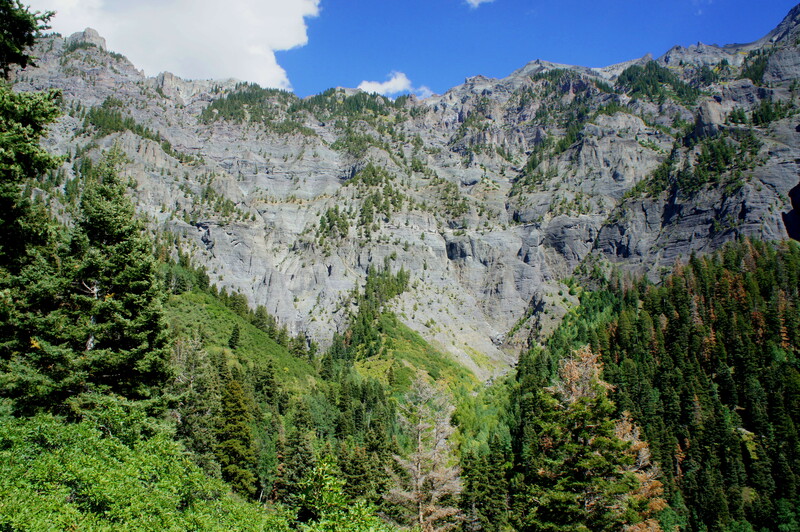 Now at least 150-200 feet above Little Portland Creek, the subsequent section offers terrific views toward Ouray and Hayden Mountain (though they will be cast into shadows in the late afternoon light). The trail drops at a noticeably steeper incline than the gradual ascent and leads to another junction at around mile 3; stay left. Winding through a series of sloping bends, hikers will reach the original trail junction at 3.3 miles; take a right, and follow the gentle slope back up to the Upper Cascade Falls Trailhead, your start and end point. As mentioned before, this 3.5-mile circuit is one of the easiest hikes in the area and will likely take 2-3 hours to complete. 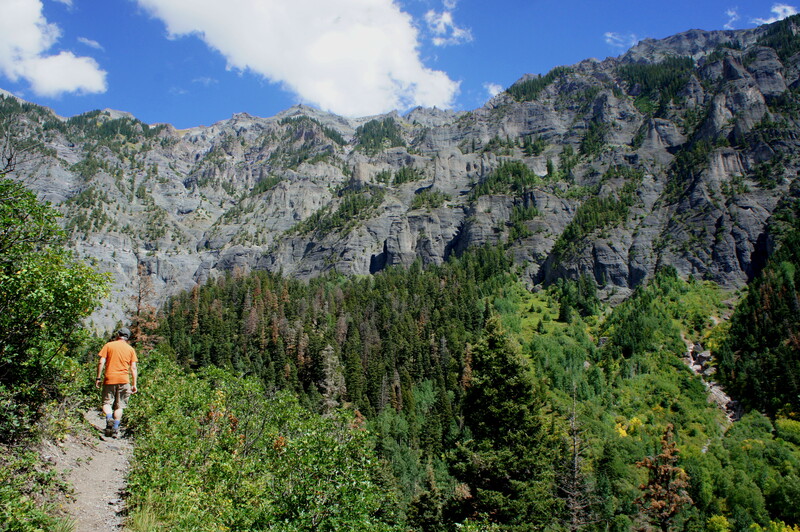 Pair this afternoon hike with a morning jaunt on the Ouray Perimeter Trail, which forms a 4-5 mile circuit around Ouray and features multicolored cliffs, waterfalls, deep canyons, and panoramic views of the San Juan Mountains. Check out the hike description here. 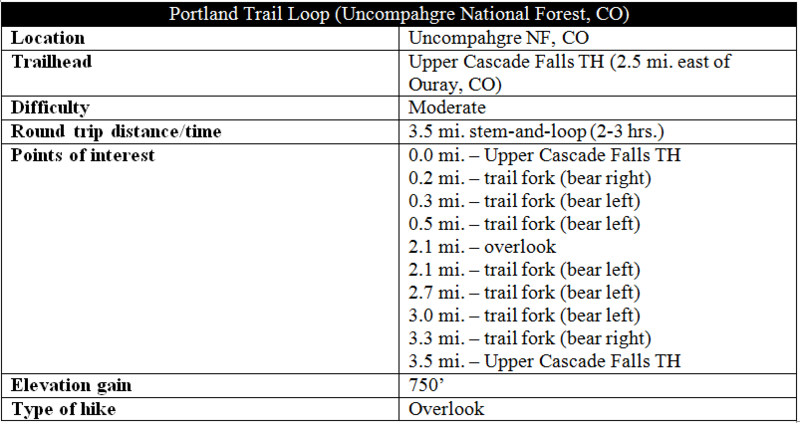 This entry was posted in Colorado, Moderate Hikes, Uncompahgre National Forest and tagged amphitheater, Colorado, Little Portland Creek, loop hike, Ouray, Portland Creek, Portland Trail, Uncompahgre National Forest, Upper Cascade Falls Trail. Bookmark the permalink. So good to see you back out west, Andrew! We are hoping to finally get to this area late summer/fall next year. It seems we are in CO in the spring and it is too early to hike in most of the higher elevations. 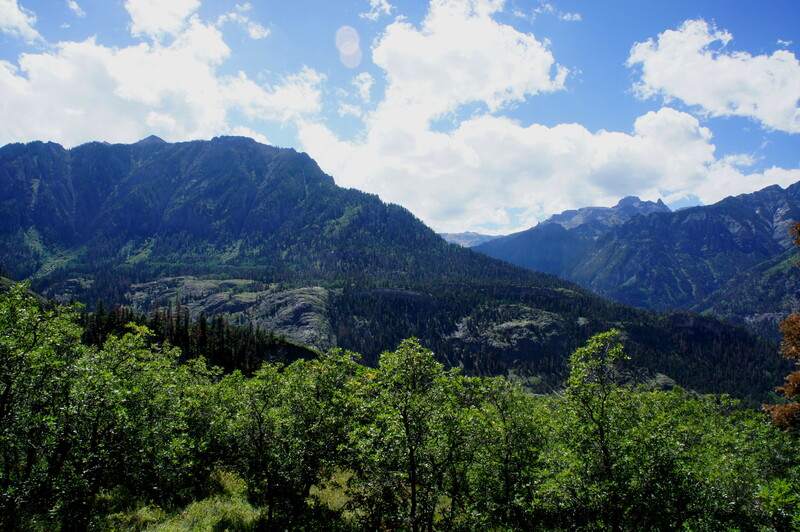 We’ve only been to Ouray with a motorcycle so we are really looking forward to hiking this area. Indeed! Alas, only for a fleeting moment, as I am now back out east again. But I savor the trips when I can get them.